This little gem of a book arrived in the mail from my friend Ro, who lives in Nottingham, England, for my birthday. 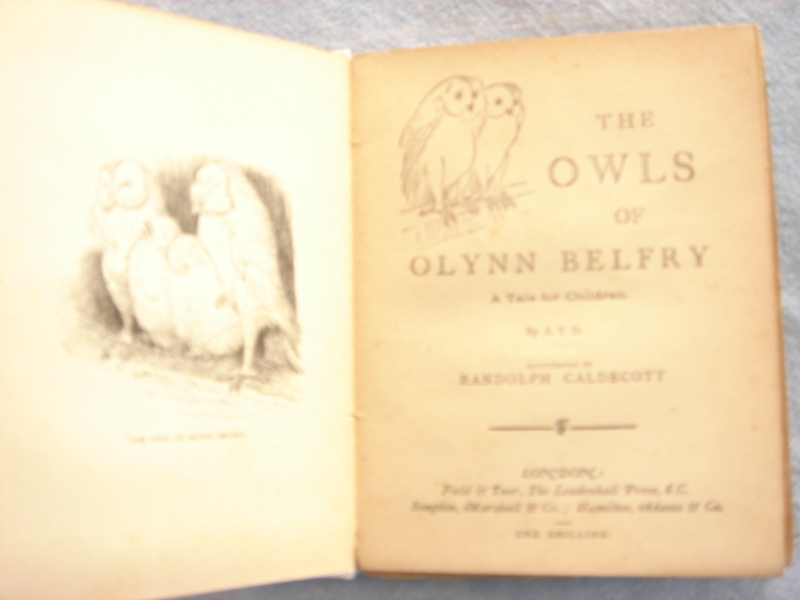 She restored the cover of this 1885 edition of “THE OWLS OF OLYNN BELFRY: A Tale for Children,” written by A. Y. D. and illustrated by Randolph Caldecott. It cost one shilling when it was published in London by Field & Tuer, The Leadenhall Press, E. C. What a remarkable book! Randolph’s exquisite illustrations include pictures of owls sleeping in the belfry, an ornithologist, children at a circus, owls attacking robbers, “aged inhabitants in the church tower,” baby owls, and an owl performing a minuet with a fairy. At the April 13th book launch for THE OWL KEEPER, hosted by Wavepaint Design & Gallery in Ipswich, MA, I met an extraordinary woman by the name of Gail Doktor. Gail was holding a stack of books she intended to buy and deliver to Children’s Hospital Boston. She and her family are the founders of Bright Happy Power, set up in memory of their daughter/sister Jessie, a twice-relapsed leukemia patient, who spent six years on treatment before dying due to complications following a bone marrow transplant. You can find out more about Jessie at http://www.brighthappypower.com and read her family’s online journal at www.dok.com. If you have books you’d like to donate to Children’s Hospital Boston, or if you’d like to contribute in some other way, you can contact Bright Happy Power by email: info@brighthappypower.org or telephone 978-356-3780.